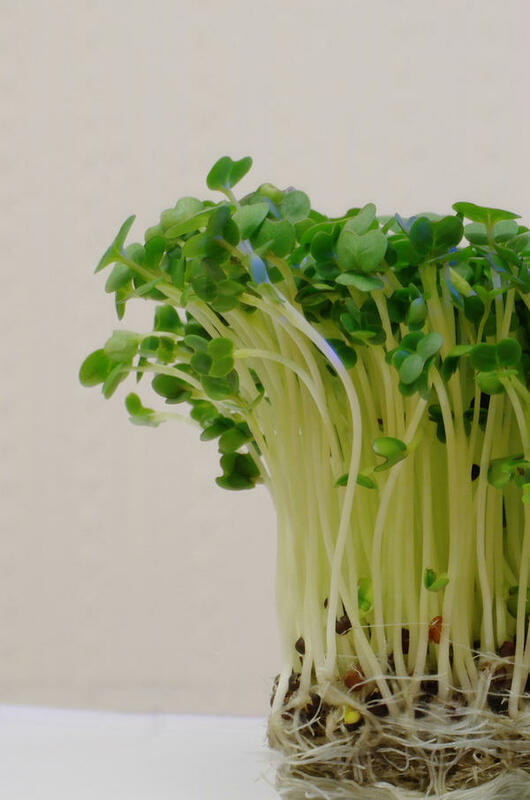 Call them “baby greens (BG).” Microgreens are the babies of leafy greens like arugula, basil, cilantro, cress, endive, kale and mustard. This group also includes the young leaves of produce that later generates beet, broccoli, cabbage, cauliflower, radish, sunflower and turnip. Their popularity blossomed in the mid 1990’s in California. Chiefs started adding these BG to salads for a new taste, visual appeal and those treasured antioxidants. Nutrients like lutein, zeaxanthin, violaxanthin and beta-carotene. “Baby greens” have high levels of folic acid, vitamin K and vitamin C.
BG are best grown hydroponically which takes 7-14 days after germination of the seed. Using water as medium is clean, fast and an efficient process. They can be grown in the home year round. It’s easy to do even without a green thumb. It would also pare down your costs for purchasing produce, especially during those expensive winter months. For optimum growth, these plants need high sun levels or the use of plant lights. Seeds are not placed closed together. Low humidity and proper air circulation are too factors that encourage quality plants. Renovating Your Mind loves them for salad, as a garnish, used in a sandwich stuffing, to top off pizza and also in soups. Every different type of “baby green” has a varied appearance and taste. In addition, they each have their own unique assortment of nutrients. This immature green has high amounts of chlorophyll and enzymes. Chlorophyll is known as the “green blood of plants.”It supplies us with high amounts of magnesium and helps detoxify the body. Enzymes are proteins that help in breaking down our foods to yield energy to the body. These younger green leafs sometimes have nutritional numbers higher than the mature plant. No worries about bacterial or any type of contamination like with sprouts. Purchase your seeds from a reputable organic seed bank to ensure there will be no problems with bad organisms, like e-coli and salmonella. Once they are cut for use, they do have a very short shelf-life. Refrigeration keeps them fresher, usually for an extra week. 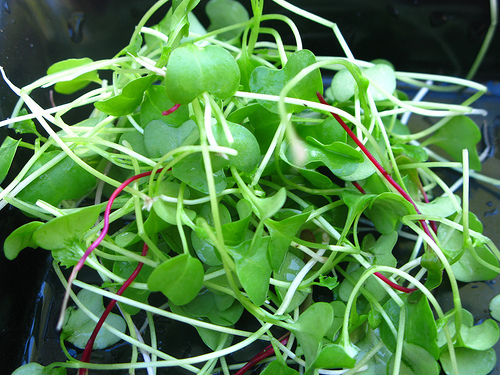 Now for your visual appetite, here are some delicious cress microgreens. Enjoy!